As you might have read, Version 1.13 is a pretty significant patch that will have positive effects on players at all skill levels. I thought I’d take a moment to walk people through the decisions made for this version. I know I personally love to read about the design decisions made on some of my favorite games – I absolutely love reading patch notes – but even better is hearing the why. So that’s what this is. Before I go on, I should quickly mention that the latest version that’s out on Google Play (and Amazon!) is actually 1.14 – this is just a hotfix cleanup patch that cleaned up a couple of residual bugs from the big 1.13 patch. If you haven’t already, you can read the complete notes for 1.13 HERE. This was the biggest thing about this patch, so I’ll talk about this first. I already made a small blurb in the last post explaining the reasoning, but I’ll go on a bit more in detail now. I can’t talk about Firebomb without first talking about Flame Trap, the old spell and why it needed to be replaced.Flame Trap was, like all of the skills in Auro, the result of a months-long trial-and-error period where we tried about 20-30 different abilities that would allow Auro to create flame. We were able to find a few things that we definitely couldn’t do. Allow Auro to create flame 2 tiles away in a straight line – This allowed for the very dumb and flat interaction of Auro | Rat | Empty Tile, casting a flame on the empty tile, and bopping him in. Direct damage. The problem with direct damage – outright killing a monster – is that you basically cut off the entire engine of the game – bumping. Of course, we do have direct damage in the game already with Blast, but Blast has enough interesting going on that it’s not too bad (for now). Either way, we knew that even if the game could maybe tolerate one direct damage spell, it certainly couldn’t tolerate two. Various forms of trailing flame. We’ve tried lots of different ways to make there be some kind of “hot-themed” status effect that would work. Some turned tiles into lava (unusable tiles), some made a character explode after a turn, and some were like the current Smokey Flavor except it lasted longer and would only activate if the actor was bumped. None of those worked. We were having a similar problem here with flames everywhere that we had with Ice Wall – it actually makes the game less interesting when stuff just gets too blocked off. When we were going over the fire abilities, it was getting close to the “cut off point” development timetable. In other words, we needed to get stuff “good enough for launch” and then just stop working on these abilities so that we could actually finish the game and get it out at some point. Flame Trap was basically a “good enough” solution for launch. While it did avoid most of the most severe pitfalls of a bad fire ability, it wasn’t anything anyone was ever particularly excited about. I’ve always had a bit of an issue with it for the fact that it doesn’t really do anything except create terrain, and since you can’t aim it or anything, the skill cap for the ability is very very low. Floe, you could argue, also doesn’t do anything except create terrain (although it does freeze for a turn, a functionality I make good use of when I play, floe aside), but at least you can aim it. In watching advanced players play more, it became more clear to me that the optimal use of Flame Trap was just “use Flame Trap whenever you can.” Preferably when the board was mostly clear, although even that wasn’t completely true due to the “gives smokey flavor” aspect. This simply meant that flames are going in that spot one way or another (with some exceptions). An obvious, simple answer would be to just let players choose which tile to put a flame on. That’s not TOO awful, but it’s pretty weak so we’d have to decrease the cooldown a lot. But also, I think part of what makes the abilities interesting and challenging to use is their shape. Each ability has a set of rules to it and you, as the player, have to figure out how to fit that weird jaggy set of rules against the set of monsters and other conditions you’re up against. I wanted to take the opportunity to turn this boring spell into an exciting spell. I wanted to find an ability that would move actors on the grid in a new way, that would make the game more complex and interesting to play overall. Something that would synergize well with other abilites. Utilizing the “explode” functionality and putting it on those diagonal tiles was really quite perfect. One neat thing about this is that it might actually push some monsters closer to you. 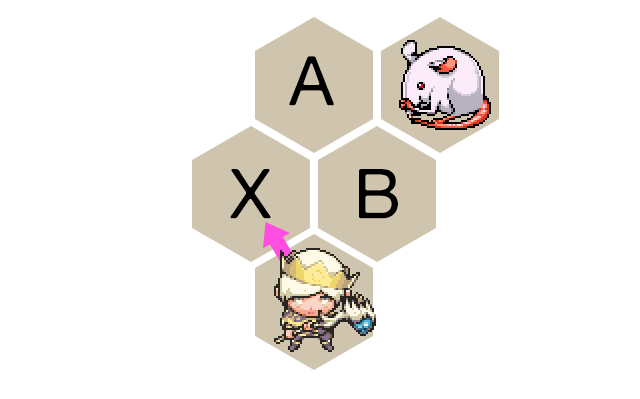 Also if we had done it in a straight line instead, one of the tiles wouldn’t be useable (if it’s Auro | Rat | Tile, and you cast it on the tile, nothing happens to the rat). So the diagonal works really well. Of course, it’s too early to really pat ourselves on the back about it too much. We hope to get more feedback from you, the players, on how the ability is working. However, I’m pretty confident from what testing we have done that Firebomb is a massive improvement over Flame Trap. You’d think that the placement matches thing would be pretty easy, right? I mean, plenty of games that exist already have placement matches! Well, not many single player games have placement matches – in fact, Auro might be the only one in existence (let me know if I’m wrong about that). My initial thought with placement matches was to have it be played on a Normal difficulty setting, and just make it that in order to get Master level placement, you’d have to get some crazy amount of points, like 200 or something. Problem was, that’s really boring and annoying for our highest-level players. Another problem is that Normal is kind of crushingly hard for some of our lowest-level players. Level 1: Level 1 from Easy Mode. Any levels beyond 4 just continue on master mode, getting harder and harder, although not too many players survive too far beyond that anyway. With this new sharp difficulty rise in place, we now get much more resolution for placement at all levels of skill, while keeping the game reasonable to play at both ends of the skill spectrum. Further, players are guaranteed a reasonable game-length. Like all our new features, this will require some more testing, but it’s definitely the start of a massive improvement. This is a big one. Quiz time! In the following diagram, Auro moves from his current tile to Tile X. As a response, does the rat move to Tile A, or Tile B? What determines this? Currently, the answer is, it’s random. This is the kind of randomness which the player has very little time to respond to. As I wrote about in my article on my blog recently, this is technically “input randomness”, but it’s so close up to the player, moving to an adjacent tile, that it functions a lot like “output randomness”. For instance, consider the scenario where there is a water tile at the tile northeast of A and a pillar at the tile east of B. In this case, it’s clearly far more preferable for the rat to move to tile A. What this meant was, players were often gambling their turn (like drunk rich aussies gambling at Australian casinos), hoping for good results. They would move to X and hope that the rat moves to a good location. This kind of random, and over the course of a full game it could make a significant difference in terms of how difficult a game ends up being. Even just one hit point that you could have had if it weren’t for that pesky random rat could mean the difference between winning and losing. The new rule is that when faced with a situation like this one, a monster will choose the direction that is most similar to the direction you just moved. Often, this will be the exact same direction. In the case above, it would move to Tile A, since a West move is most similar to a northwest move. A note about this new rule: this only affects actors who are moving into a tile adjacent to Auro. Actors moving from 3 tiles away to 2 tiles away still use the same random code. We don’t want players to have to calculate this much stuff for the entire board. It’s OK if the movement of monsters is slightly random, it just can’t be random and in your face. Please enjoy 1.14, and either way, let us know what you think on the forums. Awesome! I love reading detailed patch notes, too. While I think in the case of e.g. LoL or Dota they might be more exciting than the game itself, that’s certainly not true for Auro. It’s marvellous to see the game becoming yet stronger. It wasted very little time already on release, especially compared to the standards of most other videogames these days. But these changes increase the density of high quality decision-making situations even more. 1.13, the number of the beasts: Major patch for monster-bumping Auro | ShouYou手游资讯网|汇集中西最新手机游戏资讯!